Attracting potential buyers to your franchise is a critical part of growing your business. In our recent articles, we introduced the types of people who are purchasing franchises, and explained what motivates them to choose a franchise over starting their own independent business. But once someone is interested in your franchise, you need to understand how to communicate with them and guide them along the purchase process. By knowing what type of information they are looking for, and what sources they turn to when conducting research, you’ll be better able to find the right buyers and convert them into franchisees. This article will show you the four most important sources buyers use when comparing franchise opportunities. Your current and past franchisees have first-hand experience with your brand, meaning they are best positioned to provide an honest opinion to buyers. For this reason, the Franchise Motivation Survey found that 86 percent of potential buyers said existing franchise owners influenced their decision to buy. Importantly, nearly half said this was the most credible source of information because they were viewed as objective compared to other sources. So what can you do? One idea is to feature testimonials on your marketing materials. Tell the story of some of your top franchisees and show how they’ve been able to succeed with your brand. Personalize it by including a picture, and use real quotes that demonstrate how they are satisfied with their decision. And remember, potential buyers will get the contact information of your current franchisees in Item 20 of the Franchise Disclosure Document (FDD), so you should expect that they’ll be in touch to hear about their experiences. Company materials are the second most important source of information for potential franchise owners. In fact, 83 percent said it influenced their decision. This means that, in some ways, you get to shape the messaging to align with the type of buyer you want to attract. One of the first places potential franchisees will visit is your franchise website. Specifically, your franchise website should provide information about your business, the support and training you offer, and the level of investment that is required to open a franchise. Interested franchisees will also download information kits that provide more detail than your website. These information kits (also known as “lead magnets”) can be used to capture the email address and phone number of potential franchisees so that you can reach out and have an initial conversation. Finally, webinars are a great way to present information to a number of interested prospects and answer any questions they have. Webinars can also be recorded and made available on-demand as part of your marketing efforts. At Sparktank, we aim to showcase our clients’ unique benefits and brand personalities in their franchise recruitment websites and advertising campaigns. 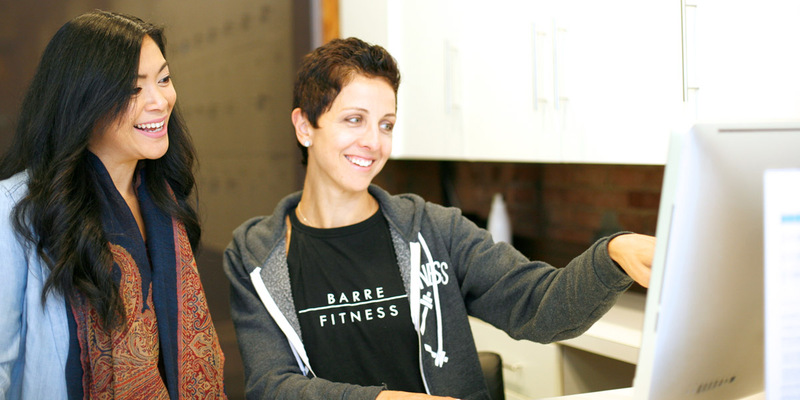 We’re excited to be working with Barre Fitness to help their franchise grow! In the Franchise Motivation Survey, 82 percent of franchisees said face-to-face meetings were important to their decision making. This means that the meetings you and your franchise recruitment team have with a potential buyer are critical. This is the time for both of you to determine if you are aligned in your goals, ambitions, styles, and expectations. Talking to company reps is also a great way for buyers to ask questions that go beyond what is on your website or in the FDD. For example, buyers may ask you about your approach to marketing and sales, the types of support and training you offer, and how you identify new franchise locations. You also have the opportunity to ask them questions to ensure they fit with your brand and ways of doing things. Determine if they will be able to succeed within your model and operational procedures, and if they share the same vision about where the business is heading as you do. Similar to talking to existing franchisees, many potential buyers will visit your locations to understand how the business operates. This way, they can see the type of environment they’ll be working in, and whether it matches their skills, experience, and objectives. You can encourage potential buyers to visit your franchises, or even bring them there as part of the screening process. This is especially important if you expect the franchisee to be actively involved in the day-to-day operations of the business, as you want to make sure they will be able to do the work effectively once they open a location of their own. While other sources of information are used by franchisees, such as third-party websites or franchise consultants, the Franchise Motivation Survey found that these top four – current franchisees, company materials, face-to-face meetings, and existing locations – are by far the most important when it comes to influencing their decision to buy. By knowing how buyers find and use information, you can align your messaging and your marketing campaigns to attract the right franchisees that fit with your business. Need help finding qualified franchisees and providing the information they’re looking for? Contact us for more information.